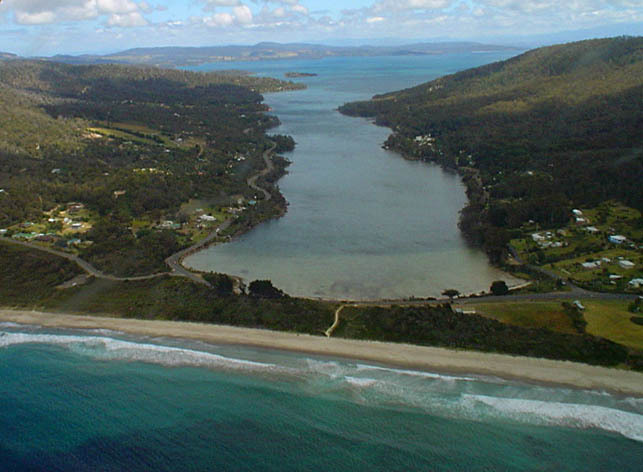 Eaglehawk Bay is a narrow, picturesque inlet extending from the narrow isthmus linking the Forestier and Tasman Peninsulas to join the much larger Norfolk Bay, some five kilometres to the west. Not much more than a hundred metres in width for most of its length, Eaglehawk Bay provides a majestic and tranquil backdrop for motorists after they leave the ‘Neck’ and follow the line of the bay along the Arthur Highway towards Port Arthur. Photo: Arthur Orchard – View of Eaglehawk Bay from the Dog Line at Eaglehawk Neck. During the convict era many an escapee must have looked longingly across this bay as he sought freedom from the brutality of Port Arthur and the Saltwater River coal mines – deterred from swimming by the rumours of man-eating sharks in the narrow waterway. 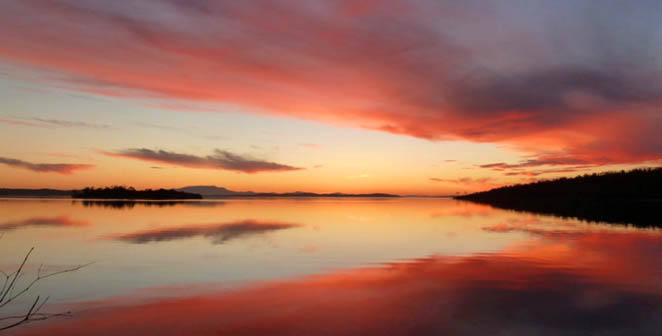 Photo: Tanya Smith – Courtesy: Louise Cunningham – Sunset over Norfolk Bay from Eaglehawk Bay. Nowadays there are plenty of flathead, one of Tasmania’s best eating fish, to be caught throughout the shallow waters of the bay and there is a good boat ramp at Taranna that is protected in most weather.